How much do you show how much you love your dog? A lot? A little? (You don’t really, only putting up with the thing because your wife loves it, and you love her?). 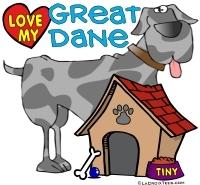 Some Great Dane lovers/owners/breeders celebrate their love of the breed within their homes. They wear t-shirts with classy images like this one. They get their dogs silk-screened onto coffee mugs. They might even hang a velvet painting in their office. One step up is to make a statement outdoors. That’s right. 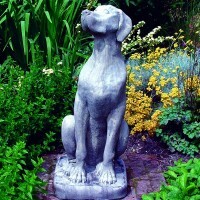 If you want to tell anyone who can see your garden that you’re a Great Dane fan, then the Internet can introduce you to folks who make garden statuary. Here’s an example of a statue that will set you back $900, plus whatever the shipping is to your home from Leicester, England. Stage three, after you’ve become thoroughly besotted with brindles, harlequins, blues, fawns, or Scooby-Doo, is to broadcast your love. Use your car as the megaphone. You can get a full car wrap. It is expensive, though, and something I wouldn’t do unless you run a dog business. Secondarily, you could get a vanity license plate. Great Dane license plates are much cheaper and easier to change if you suddenly decide a Shih-Tzu is better because the food budget is 1/15 as much. So what do we do? How does our family show we love Luna? We feed her 3X a day. We put the gas fireplace on for her, even in June. She gets exercise almost every day. We play more Michael Jackson than is healthy for a human to listen to. Luna likes his Greatest Hits album. She drinks tea with us. It’s not a “LUNALVR” vanity license plate but it’s a good start. 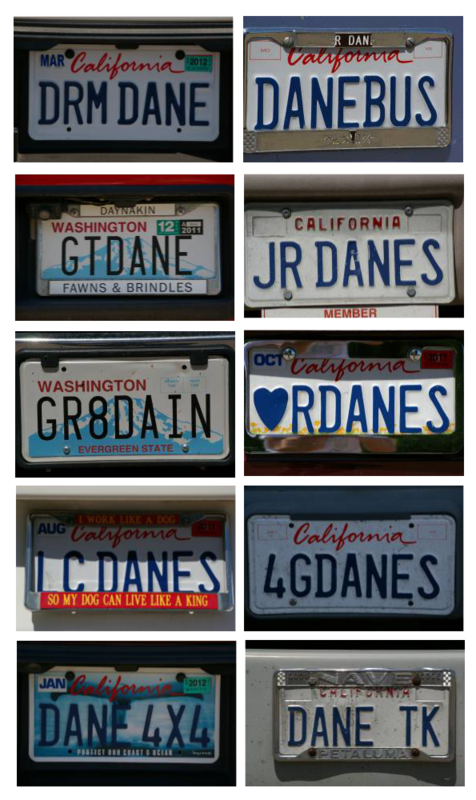 It’s a Great Dane License plate, though, I think she’ll love.